Sue Devitt may not be the most well-known brand here in the UK so to give you a bit of background, it's a range designed by the Australian celebrity makeup artist of the same name. Inspired by nature and Sue's global travels, the products are jam-packed with skin friendly ingredients. 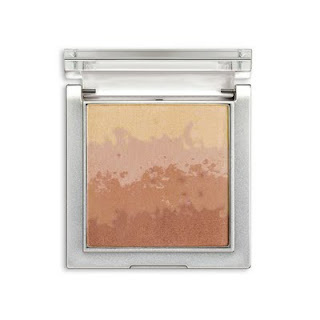 I was sent the new Hydrating Marine Minerals Destination Eye & Cheek Palette in Beau Soleil from her Spring Summer 2011 collection which has been inspired by Sue's latest travels, this time to Vieques, a small island off the coast of Puerto Rico. Describing her inspiration, Sue said, "Looking out onto the Bay from the shade of the Mangroves, I wanted to capture the golden glow of a Caribbean escape without the sun's harmful effects." ﻿The palette certainly captures the warmth of the Caribbean. The colours are richer, with pinker tones than the image suggests and are very wearable for daily use. I really like the multipurpose aspect of the palette as you can swirl your blusher brush around the four shades to use on cheeks or use each of the shades individually as eyeshadows. The colour is easily buildable making it particularly handy for creating a sculpted appearance if used on the face. The shades look matte in the palette but I noticed a natural, radiant glow when I applied it to my cheeks, without a hint of telltale glitter. For eyes, I used the top colour as a neutral base before blending over the bottom colour from the palette. It's a less scary and more grown-up way to tap into this season's trend for amber shades and I think these shades would look especially good on those with blue eyes.